Just like the American omelet, omurice can be tailor made to suit your tastes.My sweet friend and superb translator, Nisia, kindly agreed to share her vegetarian-style omurice recipe and photo. 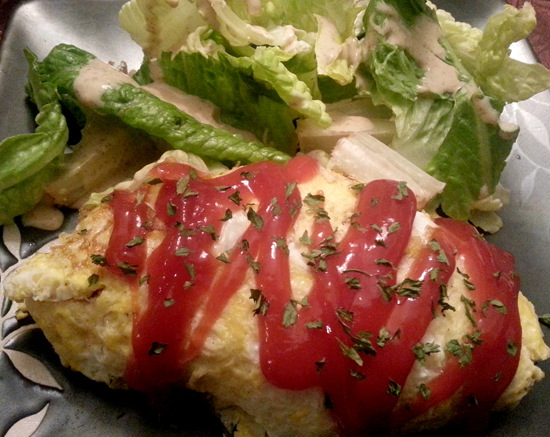 What creative twists will you add to omurice? ?200g (just under 1 cup) canned tomatoes ? In a pan coated with olive oil, fry the onions and garlic over low to medium heat for 1 to 2 minutes. Add tomatoes. Stir in rice and green peas. When piping hot, transfer to a bowl. For the omelet, coat a clean pan with olive oil. Swirl in a thin layer of the egg mixture. Keep swirling the eggs over the surface of the pan. When slightly set, scoop the rice mixture into the middle of the eggs. Flip the sides of the egg over the rice. Gently slide the omelet onto the plate so the bottom of the pan is now on top. Garnish with a squiggle of ketchup.